The American University in Cairo (AUC) has recently signed a three-year agreement with King’s College London, which is ranked among the top 25 universities worldwide, for a student summer exchange programme as well as academic and research collaboration. Tolba added that the agreement may extend to a faculty exchange programme as well. While AUC students will travel to King’s College London, students from King’s College London will also be able to attend courses at AUC as part of this exchange programme. 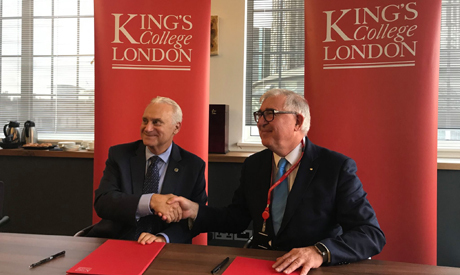 AUC has been working closely with King’s College London since September 2017 to reach this agreement, initially meeting through study-abroad conferences, including the European Association for International Education, one of the largest study-abroad conferences in the world. Tolba noted that because UK universities have a different educational system of their own, unlike the United States or other European countries, partnering with King’s College London is considered a major success. “The reason the agreement is only for summer exchange is because King’s College courses are on a yearly basis, not by semesters, so it’s not easy to send or receive exchange students during the fall or spring semesters,” he explained. This is AUC’s fourth UK exchange agreement. The university is already collaborating with the University of East London, the University of Liverpool and University of St Andrews. Currently, AUC has more than 170 international partnerships with top universities worldwide.